The Cisco SPA525G2 is a 5 line business IP phone with both wired Ethernet ports and built in Wi-Fi. It is a great option for Small and Medium Sized Businesses (SMBs) with limited CAT5/6 cabling in their office. Read our WhichVoIP.com editorial review below for the Cisco SPA525G2 5-line WiFi IP phone. You will also find information on setup and installation for this phone along with user reviews. If you have questions, use the Q&A tab above and we will respond promptly. The key advantage of the Cisco SPA525G2 phone over other phones is its ability to connect to your WiFi access point. This may sound like a trivial feature but in fact most phones in this price range do not offer WiFi. Businesses that do not have CAT5/6 wired throughout their office will see the immediate benefit that this offers. The WiFi supports the 802.11b and g standards which is supported by most access points (i.e. the newer 802.11n standard is backwards compatibility with b and g). The price is relatively inexpensive for a Cisco 5 series phones. Amazon sells the SPA525G2 for around $130. It is feature rich and the WiFi addition makes it a serious contender for SMBs looking at multi-line SIP phones (5 lines in this case). Voice quality is excellent and just what you would expect from a 5 series Cisco phone. Setup does not take long if you are familiar with Cisco phone portals. A few settings and you will be up and running. If you are buying through a provider then it will be configured for you, most likely, with the exception of WiFi (see our guide to WiFi configuration later). The QVGA (320x240) LCD color display is sharp and you can display digital photos and view RSS feeds. If you own Cisco video cameras (models WVC2300 and PVC2300) you can even view video feeds on this phone which is a neat security feature. If you use the wired Ethernet port rather than WiFi, you may be interested in the built-in Ethernet switch that enables you to connect to a down-line PC or laptop. This saves you adding a discrete Ethernet switch if you only have one RJ45 jack at your desk. The wired port also supports Power over Ethernet (PoE) which is quite standard these days but nice to have if your switch supports it. Note if you use WiFi the WAN port is disabled. Also keep in mind that the Ethernet is 10/100 and not Gigabit. A 2.5mm headset jack is provided as is Bluetooth, which may be useful if you own a Bluetooth headset. An expansion module can be purchased (SPA500S) to extend the number of programmable buttons for the SPA500 series of phones. Each expansion module supports an additional 32 buttons and a maximum of 2 expansion modules can be used, thus 64 buttons. This can be very useful for administrative staff since it simplifies dialing and call transfers. The SPA525G2 does not ship with a power supply. It is likely most customers buy this phone for its WiFi capability rather than PoE so in my opinion it is poor that Cisco does not ship a power supply with the phone. It is worth noting that Amazon has many non-Cisco power adapters that should work fine and are very inexpensive. This is more of a general complaint but if you are not used to the Cisco phone portals where you configure the device it can be confusing. I really wish they would add in-line documentation next to each configurable item, as there are hundreds of settings and many are far from intuitive. If you purchase from a provider then this will not be an issue (i.e. pre-configured). Pricing is reasonable – around $130 for a WiFi phone. SPA525G2 can support up to 5 SIP accounts. Quality QVGA color LCD display. Does not get shipped with a power supply. 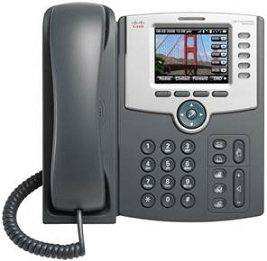 The Cisco SPA525G2 is a nice looking and feature rich IP phone. It is reasonable priced and definitely a consideration if you need WiFi connectivity or multi-SIP accounts. The color display is sharp and the ability to display images is a nice feature, for example showing a photo of your family. If you have Cisco video cameras you can feed these directly to your phone for added security. Disc featuring the documentation manual. Cable for connecting the base and handset. If you have purchased your phone from a service provider, installation is as simple as powering on the phone and configuring WiFi. 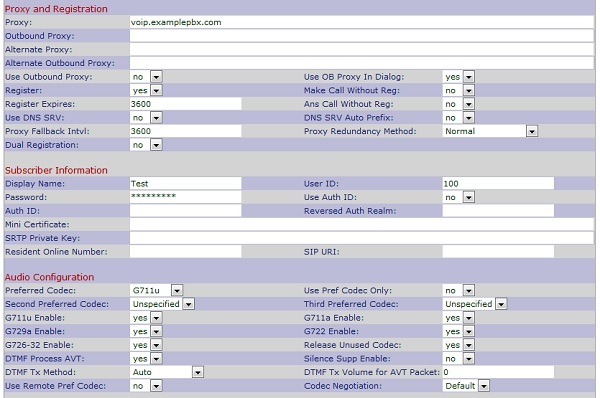 If you are manually connecting to a provider or using your own PBX some additional configuration steps are necessary. Either way, WiFi must be configured so let's start there. This of course assumes you are using WiFi, if not, ignore the following section and simply connect an Ethernet cable. Perform the following steps to configure WiFi on your SPA525. Make sure no Ethernet cable is connected as this would disable WiFi. Power on the phone and when it boots-up to the splash sreen press the setup button (this is the key that has the folded paper icon on it). 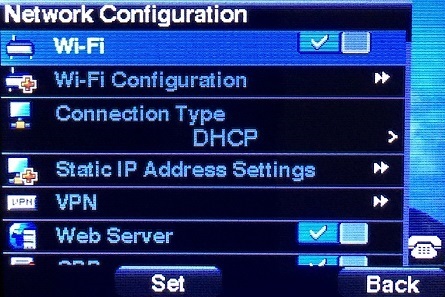 Goto Network Configuration using the down key (number 8 in my firmware version) and press Select. Goto WiFi and press the right arrow and then the Set soft key to turn WiFi ON. See Figure 1 below. Goto WiFi configuration and press the right arrow. Goto Wireless profile and press the Select soft key. 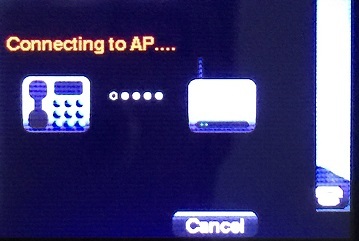 This enables you to set a profile for your WiFi access point. See Figure 2 below. 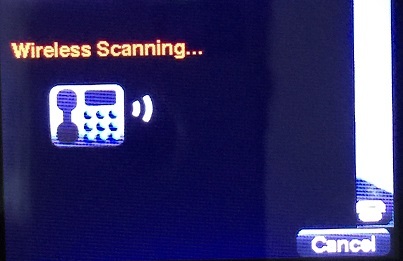 Press the Scan soft key to find your WiFi network. See Figure 3. Find your WiFi and press the Add soft key. Finally add the authentication details for your WiFi i.e. 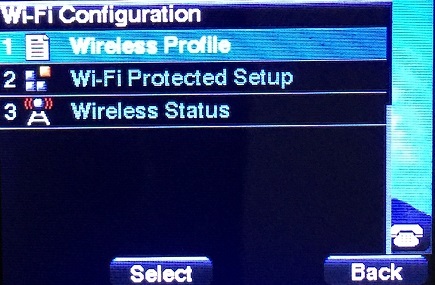 security mode, profile name, SSID, key etc. Press the Save soft key. Press the Connect soft key and hopefully you now have a network connection to the outside world. See Figure 4. Configuring your SIP account is best done using the phone portal. To do this you need to have either WiFi connected (see last section) or use an Ethernet cable to connect to your network. Now you need to find the IP address you were served since the phone defaults to DHCP (i.e. your router will serve your phone an IP address). Goto Status and press Select soft key. Now we can perform the following steps in order to create a SIP account. Bring up your favorite web browser on a PC that is on the same sub-net address as your WiFi. Click on the Admin login link for admin view and then advanced link to get the advanced view. Click on Ext 1 to configure this extension as shown in Figure 5. The important parts are to enable the line (first field under General) and then complete the Proxy and subscriber sections to match settings from your provider. If you are having issues you may also need to adjust settings inside the SIP settings (transport and port number) and Audio Configuration (codec) sections, though the defaults are likely fine for most configurations. This step may not be needed but click on the Phone tab and make sure a line button maps to Ext 1 (highly likely). Click on the Submit All Changes button at the bottom of the screen. The device will reboot and then if successful you should see your extension on the right hand side next to one of the line key buttons and it should show it is registered. You can now make and receive calls. The SPA525G2 truly is an excellent phone and is worth considering if you are in the market for a multi-line SIP phone that must support WiFi. We're sorry, there are currently no user submitted reviews for Cisco SPA525G2 matching your search criteria at this time. Please add your own review or check back later as reviews are being submitted often.